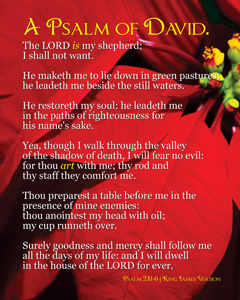 As I’ve been working on several Series pieces this week, proving the preached Word, Life’s Realities has been a recurring theme which has grown out of Psalm 23 in a most fascinating way! 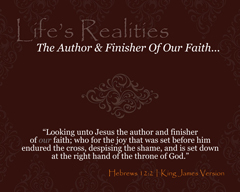 Here’s my question to each of us – Are we living Life in the Reality that Jesus is “The Author & Finisher Of Our Faith?” Are we living in the Reality that Christ for the Joy that was set before Him – Endured the Cross, Despising the Shame, AND is Set Down at the Right Hand of the Throne of God? There is an ACTION required… We are to be “Looking unto Jesus” as one of Life’s Realities for this to be so. Just what are your EYES looking unto??? Sure, you just read this – but what else have your eyes been gazing upon… Set your sight upon the King of Kings!